Want to experience extreme rock climbing? Then call Arizona Inflatable Events to rent one of our mobile rock climbing wall rentals. 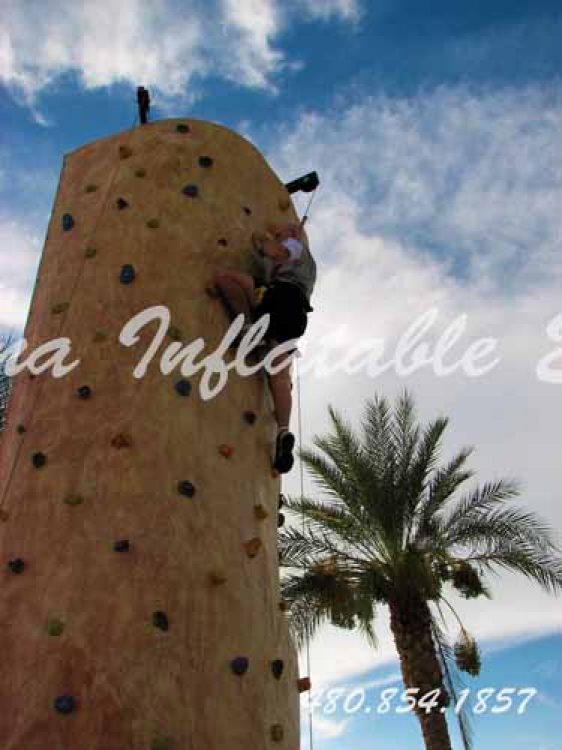 The rock climbing wall provides a safe and realistic rock climbing experience. Three climbers can climb at a time. The rock wall challenges beginners and advanced rock climbers, both young and young at heart. This popular attraction has all the latest safety features like the auto-belay system that gently lowers climber back to the ground after rock climbing to the top. 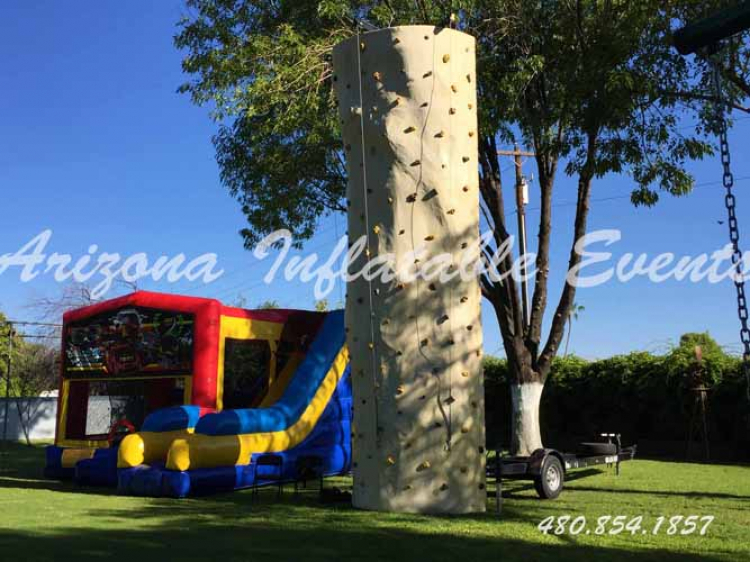 Renting a mobile rock climbing wall for your next birthday party? Ask about adding an inflatable bounce house at a discounted rate. We also offer table and chair rentals and tent rentals. Thinking about an inflatable water slide rental we can handle that as well. Don’t forget your rock climbers will be hungry try one of our concession machine rentals like our popcorn machine, snow cone machine or cotton candy machine. Having a carnival then add on some carnival games to spice up your event! When you rent a rock wall there are a few things you should know. First, the mobile rock climbing wall rental is mounted on a trailer and pulled by a truck. The delivery driver must have access through a 10’ or wider gate to the set-up area. 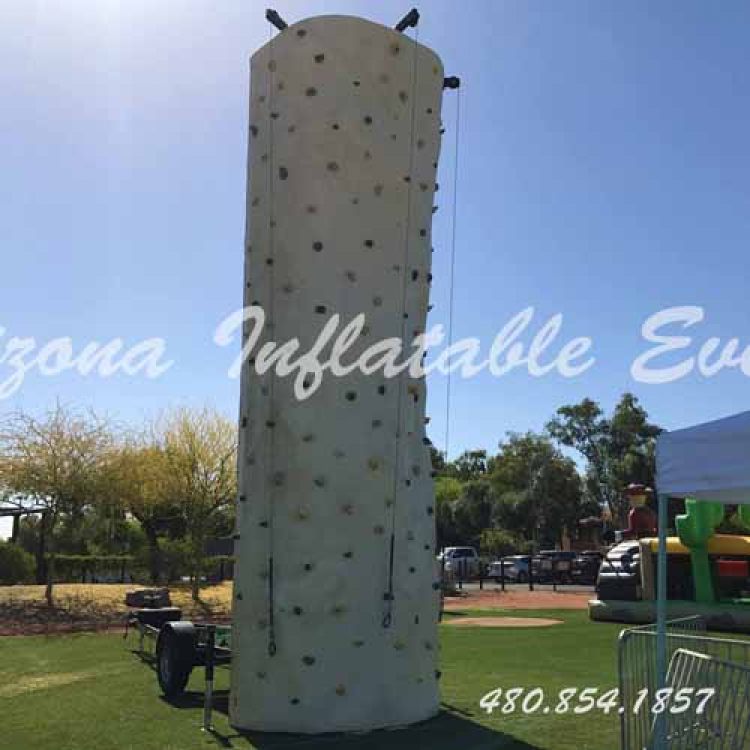 The area needs to accommodate your rock climbing wall rental is 20’ wide x 40’ long x 27’ tall. Ideal surfaces are flat parking lots, driveways, grass or rock area. The wall will be unhooked from the truck and raised by hydraulics in place. Our friendly trained attendants are the only people that should be harnessing and securing the climbers to the wall. Safety is our first priority! Though we deliver to many different cities like Chandler there may be a delivery fee or a delivery minimum. We reserve the right change pricing at any time or for high demand days.